Nelson Piquet Jr. has become the 6th different winner in succession in the 2014/2015 Formula E World championship. Nelson emulated his father by taking his first win in the championship at Long Beach; 35 years after Piquet Sr. won his first Formula One Grand Prix at the street circuit. The Brazilian driver was 3rd on the grid but quickly jumped up to the front after a lightning get-away. He managed to dispatch pole-sitter Daniel Abt and second placed Nicolas Prost as he squirmed his way into the lead at the first chicane. Further back in the field things got a bit tight, with championship contender Sam Bird falling foul of a collision with another driver. Thanks to the contact, the Virgin Racing driver’s front-left wishbone broke; forcing the Brit to pit at the end of lap 1. He jumped aboard his second car, but due to the impossibility of making the car’s battery life last a whole race, he retired later on. Bird wasn’t the only driver to be taking an early bath. Scott Speed had made a fantastic debut in the championship last month in Miami, but the home-hero wasn’t going to make it to lap 5. The Californian took too much speed into the first chicane, forcing him to drive over the second kerb. The kerb put Speed’s front wheels up in the air and then into the wall. The safety car would soon be deployed to collect the dejected driver who had been running 4th in the Andretti Autosport car. One Safety Car was followed in quick succession by another, with Charles Pic seemingly out-breaking himself into the final hairpin whilst trying to pass Loic Duval. Pic’s China racing car avoided Duval but unfortunately collected Jarno Trulli; with the contact putting the Italian out of the race and the Frenchman into the pits a few laps later for a drive through penalty. Piquet proved on both restarts that he was going to fight tooth and claw to take his first win of the year, with the Brazilian sprinting away on both occasions after great runs out of the hairpin. Piquet only lost the lead once during the race when the pit-stop phase occured; with Bruno Senna electing to stay out and lead a lap. Piquet would retake the lead from his fellow countryman on the next lap, with Senna emerging from the pits in a nostalgic wheel-to-wheel battle with Nicolas Prost. Senna would win the fight to take 6th, with Piquet, Vergne, Abt, Di Grassi and Buemi ahead of him with 14 laps to go. Daniel Abt would have been elated before the race when he learned that the fastest qualifier, Sebastien Buemi, had been moved down to 10th after exceeding the maximum power output. This, after all, had put the German onto the pole position for the race. The smile was wiped in the closing stages of the ePrix however. Abt was running 3rd when he got a drive through for exactly the same problem. He would fall down to 14th. Another driver to have bad luck in the final few laps was Nicolas Prost. He had joined Abt on the front row of the grid, but he would soon join him further down the order after a drive through after a ‘Touring Car style’ pass on Jerome d’Ambrosio into the hairpin. The e.Dams driver bumped the Belgians car which allowed Nicolas to pass. Prost would go on to take the fastest lap of the race and the championship point that comes with it. 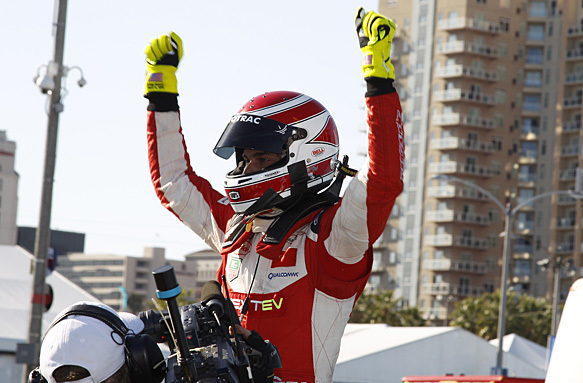 The Long Beach ePrix was one of the only races not to have a nose-to-tail fight for the lead in the closing laps, with Nelson Piquet Jr being able to coast home on the final lap to take his first Formula E victory. His father had taken his first win of his Formula One career 35 years previously on the streets of Long Beach, so it was only fitting that his son, baring a tribute helmet for the anniversary, should take his first win of his Formula E career. Interestingly, Piquet had been the winner of the FanBoost win along with Jean-Eric Vergne and Sam Bird, but the race-winner elected not to use the boost at all during the race. Jean-Eric Vergne finally got on the podium after running out of luck during his season so far. The Andretti driver had impressed right from his début in the third round, but he missed out on the win after mechanical issues. This podium now see’s him 8th in the championship despite missing the first two rounds of the season. Third on the podium would go to Lucas Di Grassi, who would take the championship lead by 1 point ahead of race-winner Nelson Piquet Jr.
Buemi put in a solid drive to take 4th place after being demoted to 10th from pole position. He finished just ahead of Bruno Senna, who equalled the Mahindra Racing team’s best finish of the year with 5th place. 6th would go to fellow ex-Formula One driver Jerome d’Ambrosio, with Buenos Aires ePrix winner Antonio Felix da Costa claiming 7th after a combative drive for Amlin Aguri. Jaime Alguersauri was just behind in 8th, with Loic Duval and Stephane Sarrazin completing the points paying positions. Sebastien Buemi took the 3 bonus points for setting the fastest time in qualifying, despite the fact that he was demoted to 10th after the session, with Nico Prost claiming one bonus point for the fastest lap of the race. There is now a month break until the Formula E championship heads to the second historic street circuit in a row. The Monaco ePrix takes place on the 9th of May, with Lucas di Grassi heading into the event with the championship lead.